A ‘Must’ For Your Magic Shelf! When I heard art book publisher Taschen were joining with Mike Caveney, Ricky Jay and Jim Steinmeyer to produce a book on the history of magic I expected something pretty spectacular. 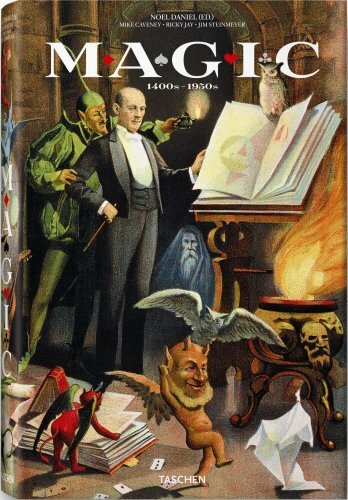 The result, Magic, 1400s-1950s, is indeed spectacular and should be on the shelf of anyone interested in magic. It is a luxurious celebration of the dazzling visual culture of magic. In 670 beautifully-printed pages it features over a thousand rare posters, photographs, engravings and handbills. It is sure to become a collector’s item. Through sensational images and insightful text, this wonderful book traces the history of our craft from 1470 through to the post-WWII years, from early street workers through the ‘Golden Age’ of the 19th century to feted performers like Houdini and the vaudevillians of the early 20th century. It’s not cheap, though good value, at £135. Or go here to get your copy for less than £80, post free! This book is a great, but heavy read! I really enjoyed it though.